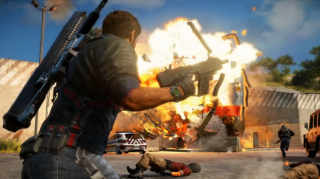 My wishlist for Just Cause 3 is fairly modest. I want more ammo for exotic guns, so I don't have to rely on boring enemy weapons for most of the game, and so I don't have to run around hoovering up dropped ammo up after every fight. I want less awful races. I want Rico to maybe crack a smile now and again. I want an even more beautiful world. That last one seems assured, if the game's E3 showing is anything to go by. Sam went hands on yesterday, but if you need more Just Cause to tide you over till December 1st, here's ten minutes of uninterrupted footage, courtesy of YouTube channel PS360HD.